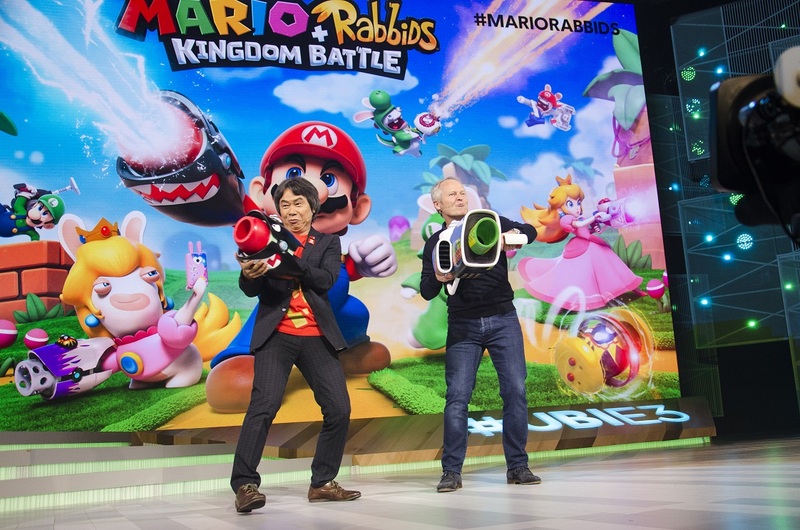 Nintendo Co., Ltd.’s Shigeru Miyamoto and Ubisoft’s CEO Yves Guillemot announce Mario + Rabbids Kingdom Battle during Ubisoft’s E3 2017 Press Conference. (Image courtesy of Ubisoft). If you had asked me what I thought a Super Mario and Ravid Rabbid crossover game would be like, I would have guessed that it would have been something like the Dreamcast’s Sonic Shuffle or Nintendo Co. Ltd’s Mario Party franchise. 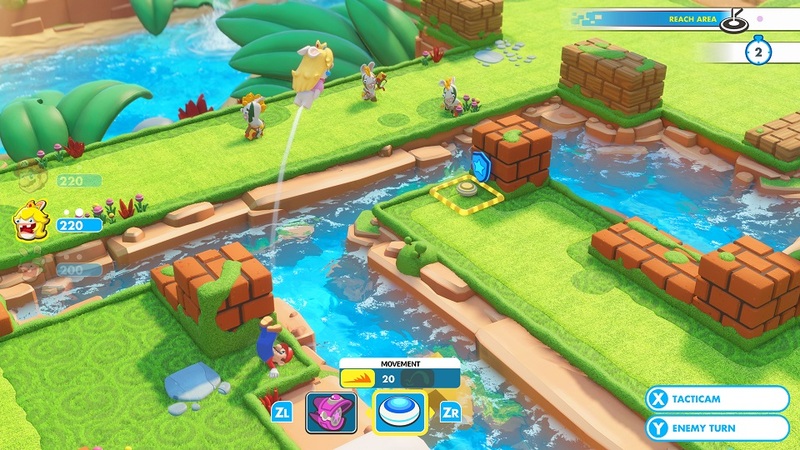 Instead, as announced by Nintendo Co., Ltd.’s Shigeru Miyamoto and Ubisoft’s CEO Yves Guillemot during Ubisoft’s E3 2017 Press Conference, Mario + Rabbids Kingdom Battle is a turn-based strategy game that has surprising amount of accessible combat depth laced with a lot of the classic Raving Rabbid franchise humor. This year at E3, I was able to get my hands on a twenty-minute gameplay demo and I was impressed with what I found. Mario and the other heroes in his team take on enemy Rabbids to restore order to the Mushroom Kingdom. (Image courtesy of Ubisoft). 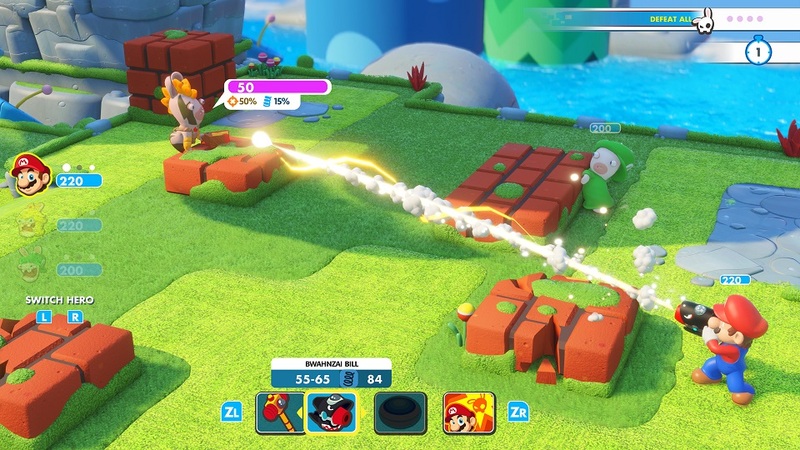 In my E3 demo of Mario + Rabbids Kingdom Battle, it became quickly evidence that there were two gameplay components to the game: A gameplay exploration portion and a combat portion. You control Beep-o as you lead the other heroes around to collect gold coins and solve puzzles. (Image courtesy of Nintendo Co., Ltd). The gameplay exploration portion had my controlling a little robot named Beep-o, and my team of heroes (made up of Mario, Rabbid Luigi, and Rabbid Peach, though eight are available in the final game) would follow Beep-o around. 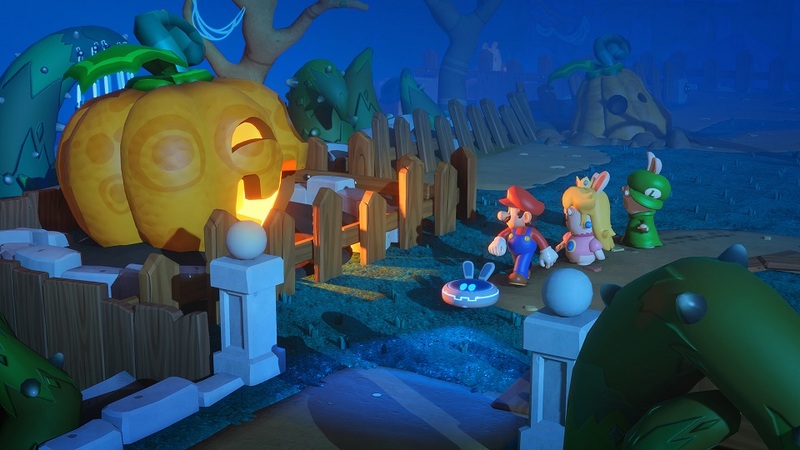 While walking around the map, I could collect gold coins, solve some simple puzzles, and occasionally see small optional cutscenes of how the Rabbids are bringing their own brand of wackiness to the Mushroom Kingdom that they have invaded. One of the biggest classic Super Mario franchise mainstays, collecting eight red coins within a time limit, have returned, as I was tasked at one point with collecting them all in a maze with suddenly appearing walls in order to gain a new equippable weapon. 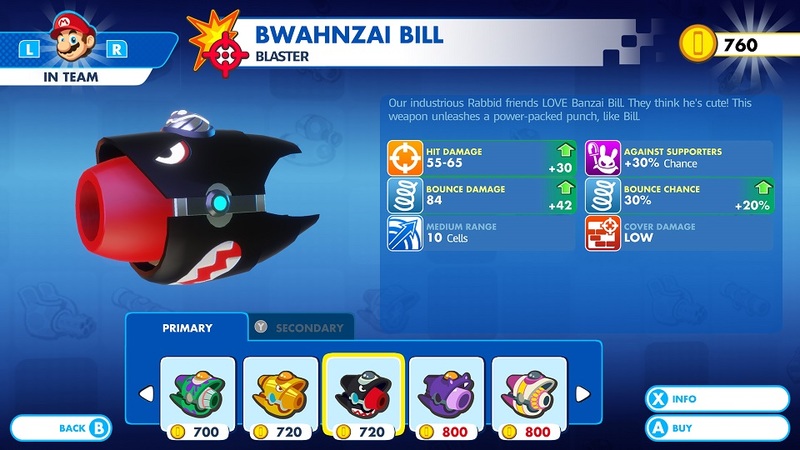 More new weapons can additionally be bought by your party through the in-game shop with the gold coins you collect, and each of them come with different stats and abilities attached to them. As a result, Mario and the team can adjust their strategies for upcoming fights accordingly. Gold coins are used to buy new weapons for your team to equip with all different stats and abilities. (Image courtesy of Ubisoft). Speaking of fights, there were three of them in the demo. Each character has an attack phase, a movement phase, and a special ability phase, and you can use one, two, or three of them each turn in any order you wish. The movement phase means that the heroes (which you control during the ‘Heroes’ turn) can move anywhere within a large range of spaces surrounding that particular hero. Cleverly, you can have your hero actually slide into the enemy to do damage and then move away further from them to behind cover or across a warp pipe or even to bounce off another character to increase his/her movement potential. The attack phase is simply that: Mario, Rabbid Luigi, or Rabbid Peach will shoot their weapon at the enemy, which will do damage based upon a series of factors like distance away, coverage available to the enemy, any status bonuses from special abilities, and the like. Finally, each of the characters have a special ability that they can use that is available only every few turns. All of this adds to a surprising depth of combat that had me instantly hooked and wanting more. Mario bounces Rabbid Peach around on the map during combat. (Image courtesy of Ubisoft). There are a few other points of interest that I think are worth me mentioning. Of the three combat scenarios, two of them were for me to defeat all of the enemies, and the last one was to have a member of the team reach the other side of the battlefield (which was up a warp pipe) while not getting devoured by a Chain Chomp who will attack anyone (heroes or enemies) that he sees. Just in the brief demo I played, it was therefore clear that there will be a variety of battle scenarios to play and experience. Second, teamwork between the characters is a major emphasis in the game. I was bouncing Rabbid Luigi off of Mario in order to get him better placed in the battle area so I could attack the enemies where they would not be protected by a barricade. Third, all of the barricades are destructible in the battle map. This includes some that even explode if they are attacked and does area damage to characters nearby them. This adds yet another level of depth to the game’s combat. Finally, there were no motion controls available for me to try out at my demo, it was just strict Joy-Con button pressing and stick movement. A Chain Chomp! If he sees you (or an enemy), the Chain Chomp will attack! (Image courtesy of Nintendo Co., Ltd). If you’re looking for a game to pick up after having completed The Legend of Zelda: Breath of the Wild, I Am Setsuna, and Mario Kart 8 Deluxe, then just based on my E3 2017 hands-on demo, Mario + Rabbids Kingdom Battle will easily satisfy that desire when it releases on August 29, 2017. 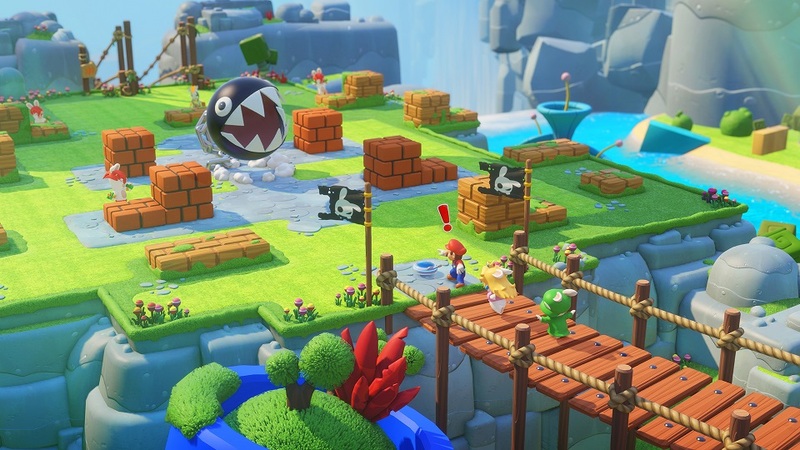 Are you looking forward to playing Mario + Rabbids Kingdom Battle when it is released? Let us know in the comments below!